Martha Borst has profoundly contributed to the success of countless thousands of men and women around the globe. As an international corporate consultant and executive coach, she is widely recognized and respected as a powerful influence and masterful leader in effective, peak performance strategies. 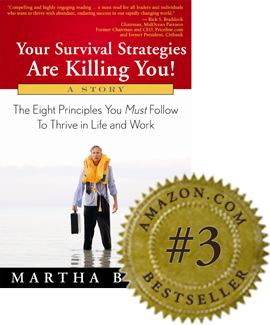 For more than 40 years, Martha has shared her wisdom, state-of-the-art tools and success strategies with individuals, entrepreneurs, educators, and corporate leaders to effectively achieve aggressive professional goals while reducing stress and maintaining balance in their lives. In companies, she creates cultures of excellence by building alignment, accountability, attitude and achievement. The time we spent with Martha Borst were the three most valuable days of my entire life. Martha is the single most positive influence of my entire career. As I grew and changed industries, partners, investors, teams, cities, and countries, Martha’s guidance and teachings have continued to be an integral part of my life, both at work and at home. Founder and President, Everest Biomedical Instruments, BrainScope Company, Inc.